At the age of 18, Ryan became homeless. Forced to leave their home, he and his father had no place to go. Ryan spent his last semester of high school bouncing from one friend’s home to another, constantly feeling uncertain of where he might go next. Over time he ran out of places to turn to for shelter and longed for a more permanent refuge. After hearing about Villages of Hope, Ryan completed the application to the best of his ability and prayed for the best. He was thrilled to be accepted and moved in immediately. “I remember walking into my room and thinking, ‘This is actually mine’. It was so nice to have a room to myself, something I could make my own. I had a bed I could sleep in and that to me was the most comforting.” Ryan continues to stay in the care of Villages of Hope and is excelling in all areas. 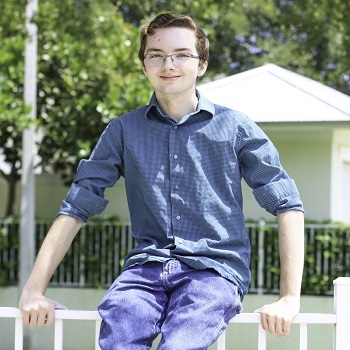 He is currently attending Palm Beach State College and hopes to pursue a career in voice acting. He found that watching cartoons as a child always brought him laughter and happiness when nothing else could. He wants to provide this for other children that need joy brought into their life. Watch his Story of Hope here.